Since our founding 150 years ago, we grew from one school to three, from 12 students to 2,200 and from one building to 46. 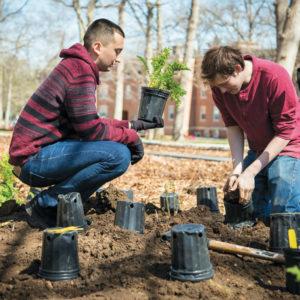 Throughout, we established and grew a powerful community by honoring our old traditions and creating new ones that link our students, faculty, staff and alums on campus and across the globe. You feared the day would never come. You roll onto campus, and the Drew Welcome Crew erupts into cheers. These people are your everything: they schlep your suitcases, your skateboard and your goldfish to your new digs. Our president joins in too! It’s a tiny piece of what drew you to Drew. BBQ. Ice cream. Rides. Rock wall. Zipline. 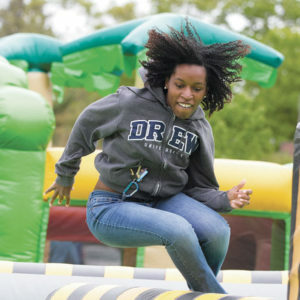 This event began when a faculty member invited his students and friends to his backyard for a picnic. It became too big for his backyard, was adopted by Drew and has been held on our campus ever since. 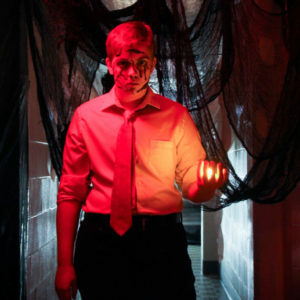 We're among the 10 most haunted colleges in the U.S. 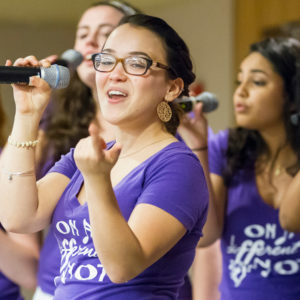 Seniors celebrate the 99th night before graduation, kicking off the countdown to Commencement. You toast. You dance. You nosh. You are legend. 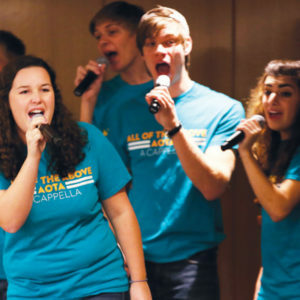 this: there is no shortage of a cappella music here. It all unites on a single night: JamFest. Hosted by one group—36 Madison Ave.—JamFest also features two other stellar groups: All of the Above and On a Different Note. Dig dirt on Earth Day as we all hail the green in our Green and Blue. Underneath our majestic oaks, we replenish our native ferns and wildflowers. You work up a sweat, protect our ecosystem and meet some special spores. 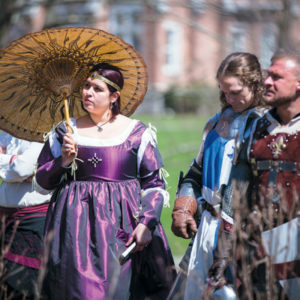 Our Renaissance shindig is like Medieval Times, but way better. Play chess with human chess pieces. Gnaw on an outsized turkey leg. Revel in song. Attend a knighting. Fear the brooding castle—S.W. Bowne Hall looms, its windows watching, waiting. 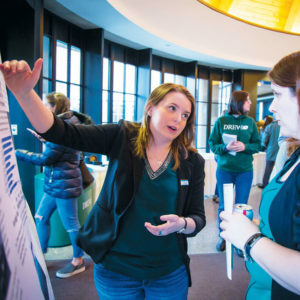 Gather at this annual showcase highlighting the best student work of the year—a studentpalooza of poster sessions, research presentations, art exhibits, performances and panel discussions. The entire campus, family, friends and alums show up for congratulations, high-fives and probably a few tears. 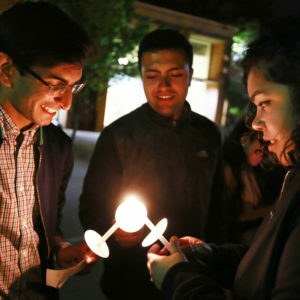 The night before your graduation, cast in candlelight, you gather to mark your time at Drew and to recognize that you’re ready to rocket into the world. Don your robes. Wear your mortar board. Process behind a most dignified marshal holding aloft our oaken mace. Its acorn and leaves signify your arrival at Drew, your time with Drew and your departure from Drew. You understand what you accomplished here and what you will accomplish out there—and you can’t wait. 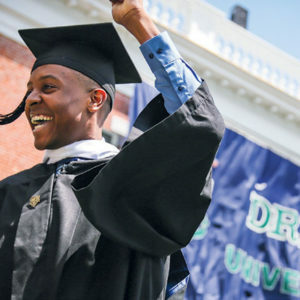 No matter where life takes you, you remain part of the Drew community. There are many ways to stay connected, but the annual Reunion is a favorite. 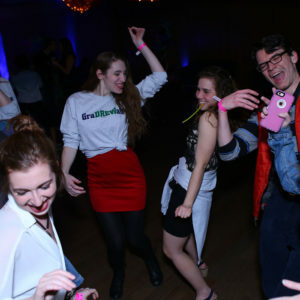 Each June, you spend a memorable weekend in The Forest for class gatherings, the Alumni Achievement Awards ceremony, a campus carnival, a reunion dinner, pub nights and more!